There are 9 Assisted Living Facilities in the Sumter area, with 5 in Sumter and 4 nearby. The average cost of assisted living in Sumter is $2,272 per month. This is lower than the national median of $3,346. To help you with your search, browse the 45 reviews below for assisted living facilities in Sumter. On average, consumers rate assisted living in Sumter 4.3 out of 5 stars. Better rated regions include Hartsville with an average rating of 4.7 out of 5 stars. Caring.com has helped 5 families in Sumter find high-quality senior care. To speak with one of our Family Advisors about assisted living options and costs in Sumter, call (855) 863-8283. Just 44 miles east of Columbia sits Sumter, a city known for its Southern hospitality and plethora of special events and tourist-friendly attractions. Of the 39,982 people who call Sumter home, just over 15 percent are 65 years of age or older. Those seniors interested in assisted living are lucky to have 30 nearby facilities to choose from, including five right in Sumter. Facilities in Sumter, as in the rest of the state of South Carolina, fall under the umbrella of community residential care facilities (CRCFs) and are licensed and overseen by the Department of Health and Environmental Control, Division of Health Licensing. Seniors looking to move somewhere affordable will like the cost of living in Sumter. The city’s index sits at 79.8, compared to the national average of 100, with housing prices being particularly low at just 48. The level of crime in Sumter is significantly higher than the rest of the country. On a scale of 1 to 100, the national average for violent crime is 31.1; that number in Sumter is 85.4, which may be an issue for seniors concerned about personal safety. Sumter experiences warm summers, with highs up to 92 degrees, and mild winters with lows rarely dipping below 33. Seniors affected by humidity may be uncomfortable, but otherwise the city offers year-round livability ideal for those who like to get outside. Sumter is steeped in history. The city is named after an important figure in the American Revolutionary War and played a key role in the Civil War, and there are lots of museums memorializing those events. Locals into arts, music and theater might also enjoy the Sumter Town Hall-Opera House, the Sumter Little Theatre and Patriot Hall. The Santee Wateree Regional Transportation Authority (SWRTA) runs public transportation in Sumter. There are both fixed routes and ADA services, and seniors aged 65 years or older are eligible for half-price fares. The Sumter area is home to world-class medical facilities, including Palmetto Health Tuomey, in the event of medical emergencies or illness. Assisted Living costs in Sumter start around $2,272 per month on average, while the nationwide average cost of assisted living is $4,000 per month, according to the latest figures from Genworth’s Cost of Care Survey. It’s important to note that assisted living rates in Sumter and the surrounding suburbs can vary widely based on factors such as location, the level of care needed, apartment size and the types of amenities offered at each community. 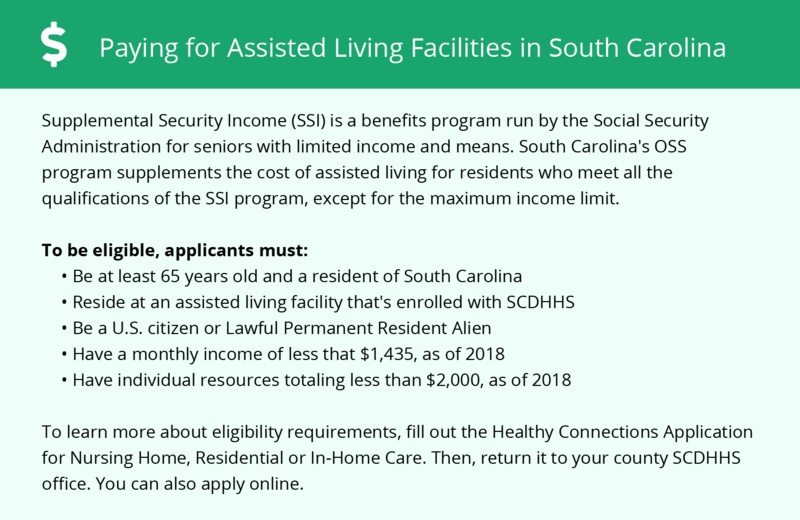 Low-income seniors in South Carolina looking for ways to pay for assisted living placement currently have just one option. 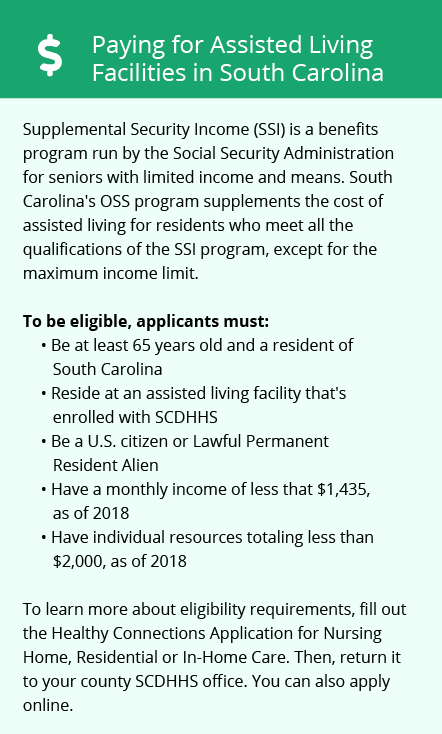 The Community Long-Term Care (CLTC) program is an initiative under the auspices of the SC Department of Health and Human Services that helps seniors avoid nursing home placement. Applicants must meet Medicaid eligibility requirements. Sumter and the surrounding area are home to numerous government agencies and non-profit organizations offering help for seniors searching for or currently residing in an assisted living community. These organizations can also provide assistance in a number of other eldercare services such as geriatric care management, elder law advice, estate planning, finding home care and health and wellness programs. To see a list of free assisted living resources in Sumter, please visit our Assisted Living in South Carolina page. Sumter-area assisted living communities must adhere to the comprehensive set of state laws and regulations that all assisted living communities in South Carolina are required to follow. Visit our Assisted Living in South Carolina page for more information about these laws.